Home // Mark Your Calendar // Join Me for Dinner? 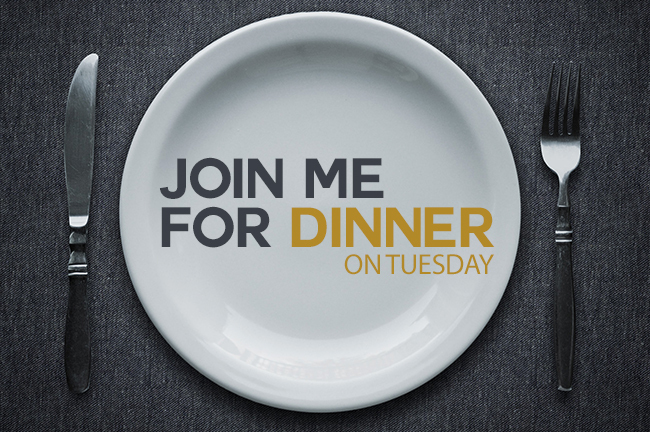 If you are in town on Tuesday night, November 24, I hope you will consider joining me for dinner. You are invited to a great Thanksgiving feast and worship service at Ingleside. The buffet meal (which includes turkey, dressing, and all the trimmings) begins at 4:45 p.m. in the Fellowship Hall, Dining Room, and Multi-Purpose Gym and will be served until 6:30 p.m. It’s $7 for adults, $5 for children, and a $21 maximum for a family. Though not required, it would help us make proper preparations if you could let us know you are coming to dinner by making a reservation here. Last year more than 500 folks joined us for dinner, and this year we will have seating for 600+. We hope you will invite friends and family and celebrate God’s faithfulness over a great meal at Ingleside! The worship service will be in the Worship Center at 6:30 p.m. Jonathan Green and our Worship Arts team will be leading musically. There will also be a Thanksgiving-oriented message, and we will celebrate the Lord’s Supper together. Children and students (ages 5 and above) should plan to join their parents in the Worship Center for this special Thanksgiving service. Childcare is provided for those 4-years old and younger. Every good gift in our lives comes from the Lord, and we should give him thanks. I look forward to seeing you on Tuesday night, November 24! Invite a friend and celebrate Christmas at Ingleside in one of four Christmas musical presentations called, “The Joy of Christmas.” No ticket is required. • Friday, December 11, at 7:00 p.m.
• Saturday, December 12, 4:00 and 7:00 p.m.
• Sunday, December 13, 10:30 a.m. and 6:00 p.m.
A service of hope and encouragement for those grieving the loss of loved ones this Christmas. It’s at 4:00 p.m. in the Chapel. Family services with live nativity will be at 3:30 and 5:00 p.m. Candlelight communion service will be at 7:30 p.m. Make Christmas Eve at Ingleside part of your tradition! Make the holidays “holy days” as you “seek first the kingdom of God and his righteousness” (Matthew 6:33, ESV). A God-centered perspective at the holidays will bring joy and peace to our hearts and great glory to our Savior!